These tubes of iron ore MIGHT have been formed by bacteria. The headlines are screaming the latest incredible fossil find. Science News says, “Oldest microfossils suggest life thrived on Earth about 4 billion years ago.” MSN reports, “World’s oldest microfossils found, study says.” The Washington Post writes, “Newfound 3.77-billion-year-old fossils could be earliest evidence of life on Earth.” I have learned to take most of the “science” you find in the major media outlets with a grain of salt, so I decided not to comment on this story until I read the scientific paper upon which all this fuss is based. As is usually the case, the scientific paper is not nearly as sensational as the headlines that report on it. Let’s start with where this discovery was made. There is a geological formation in Quebec, Canada known as the Nuvvuagittuq greenstone belt. It contains rocks formed from lava as well as those formed from sediments. These rocks, however, have been subjected to a lot of heat and pressure and are therefore called metamorphic rock, because the heat and pressure have transformed (metamorphosed) them from their original state. That’s important. I will come back to it later. Extensive geological studies have concluded that this formation was once on the ocean floor and contained hydrothermal vents. There is controversy when it comes to the conventional dating of the formation, however. Radioactive dating based on the abundance of specific uranium and lead isotopes indicates that the formation is about 3.8 billion years old. However, radioactive dating based on samarium and neodymium isotopes indicate that it is 4.3 billion years old. As a nuclear chemist, I don’t think either dating method gives accurate results, so those dates mean very little to me. However, they are important to those who are committed to believing in an ancient earth. 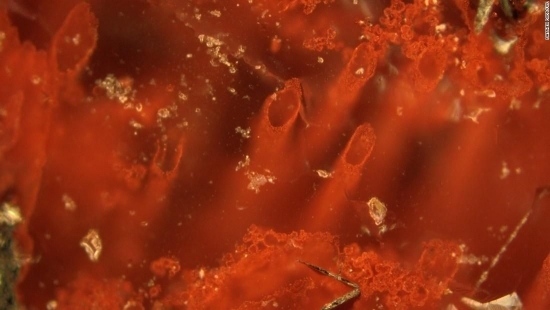 So whether or not these are the oldest microfossils isn’t really known. If one of those two conflicting ages happens to be correct (I seriously doubt it), then yes, they are the oldest. But are they microfossils? That’s not clear, either. An example of what was found is pictured above. The structures you see are tubes made of iron oxide. They have the same basic characteristics of tubes found associated with bacteria that use iron near modern-day hydrothermal vents. However, such tubes can also be formed through strictly chemical and physical processes. The authors suggest reasons to reject a non-biological origin for the tubes, but I am skeptical. Since the rocks are metamorphic, we know they were exposed to high pressures and temperatures. Those conditions can easily transform the chemicals found in the rocks into structures that look just like those tubes, with no help from bacteria. Of course, there were other finds as well. The authors of the study found several structures that are consistent with the rotting of organic matter, but once again, those same structures can be formed without organic matter as well. In the end, this find reminds me a lot of the famous Mars meteorite from 1996. In case you don’t remember, the meteorite contains several structures that are known to be produced by living organisms. Thus, this meteorite was considered strong evidence for the idea that life once existed on Mars. Over the course of time, however, it was decided that all of those structures had been produced by non-biological processes. This current situation is very similar. At this time, there is simply no way to know for certain whether the “fossils” in this study are of biological or non-biological origin. But let’s suppose they are fossils, and let’s suppose they really are somewhere between 3.8 and 4.3 billion years old. If so, then the case for the naturalistic origin of life just got weaker. After all, even the simplest bacterium is incredibly complex. Thus, if natural processes are required to produce a bacterium, it’s going to take a lot of time for all the random events necessary to produce such complexity to occur in just the right order and under just the right conditions. Since conventional wisdom states that the earth is 4.6 billion years old, those random events have less than 800 million years to happen. That’s not long, given what has to be accomplished. However, it might be even worse than that. Geological structures were recently found in Greenland that were interpreted to be stromatolites, and they are supposed to be 3.7 billion years old. Stromatolites are formed by bacteria, but the bacteria associated with stromatolites are quite different from the bacteria that supposedly made the microfossils in Canada. So if the accepted ages and microfossils in both Canada and Greenland are real, then life not only had to originate less than 800 million years after earth formed, but it also had to diversify to the point where there were different kinds of bacteria in less than 900 million years. That kind of timescale is incredibly hard to reconcile with the myriad of “lucky coincidences” required for the emergence and diversification of bacteria! Evolutionists are fond of waving the “magic wand” of time around, confidently stating that given enough time, lots of very unlikely events can occur in the order necessary to produce what we see today. As we learn more and more about the fossil record, however, that magic wand is becoming less and less powerful! Dr Wile, do you believe the earth is 6000 or 10,000 years old? I don’t think it’s possible to make that distinction. I think most of the scientific evidence points to an earth that is no older than 10,000 years. Thus, the typical young-earth interpretation of Scripture (which indicates an earth that is about 6,000 years old) is consistent with my understanding of the scientific evidence. Nevertheless, all of this (the Scriptural evidence and the scientific evidence) requires interpretation. In my opinion, then, the best that can be done is to list a maximum age, which I think is 10,000 years. Tree ring chronologies can suggest about 10,000 years. For example, there is a particularly strong one that seems to indicate an 8,000-year chronology. Since that probably doesn’t go all the way back to creation (probably just back to the Flood), it implies an earth that is older than 8,000 years. Once again, there are assumptions involved, but the assumptions seem to be good. Thank you for your reply. So, you don’t take the genealogies from Adam to Abraham in Genesis 5 and 11, then Abraham to today, literally? You think there were an extra 2000-4000 years of generations in-between? Yes, I do take them literally. However, that’s not the only way to take them and still accept the authority of Scripture. I do not believe that. Once again, however, my interpretation of Scripture is not the only one that accepts the authority of Scripture. How might you interpret the genealogies, then, as per the Bible, IF the earth was 10,000 years old, not 6000? Would you agree that if the earth was found to be even 6500 years old, then the genealogies would be wrong, or missing data? Thank you. The article doesn’t quite answer the question directly, except to suggest there are generations missing in the genealogies, which is what I was saying. If this is so, then, would you say that when the Bible says, for example, A begat B, A didn’t really beget B? If yes, do you say that the genealogies cannot therefore be historical? Using Scripture to interpret Scripture, then, we see that a genealogy is not always a chronology. While I interpret the genealogies in Genesis 5 and 11 to be chronologies, it is quite possible that they aren’t.